The guy and girl sitting on the unusually high chairs are lifeguards watching over bathers. We watched for some time as about 10 people practised their lifesaving skills by dragging a "victim" from the ocean; and unlike my brief description here, watching this mock-rescue was actually fairly entertaining. Clifton 4th is classified as a Blue Flag beach, meaning that it complies with certain quality requirements set forward by the Foundation for Environmental Education. You can read the full list of measurement criteria on the Blue Flag website. 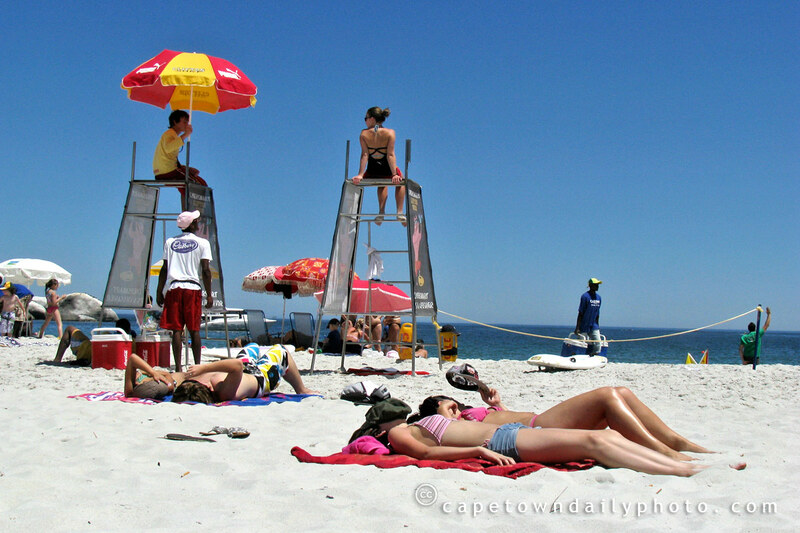 Posted in General and tagged beach, clifton on Sunday, 4 January, 2009 by Paul. I so needed a photo like this today as we woke to a snowy scene outside our windows and yes it is cold!! Nice colours on what looks a nice beach, it is around freezing here in Yorkshire today. Endless sun must have its drawbacks, but off the top of my head I cannot think of any. Clifton 4th is one of my favoured beaches in Cape Town, especially because it is sheltered from the wind! It is very important for parents to know about the water quality, so thanks a lot for the information mentioned above. We are going to spend a free time at this beach.